The Wooden Boat Association of North Texas is participating in the White Rock Lake Boat Show in Dallas, Texas on September 19, 2015. 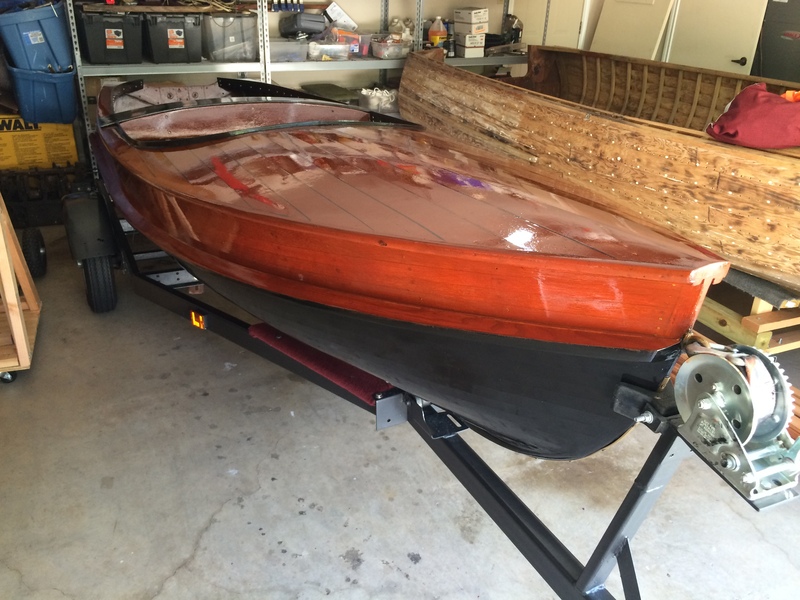 I’m planning to bring my 1950 Thompson 14′ TVT Deluxe Outboard to show as a trailer display. 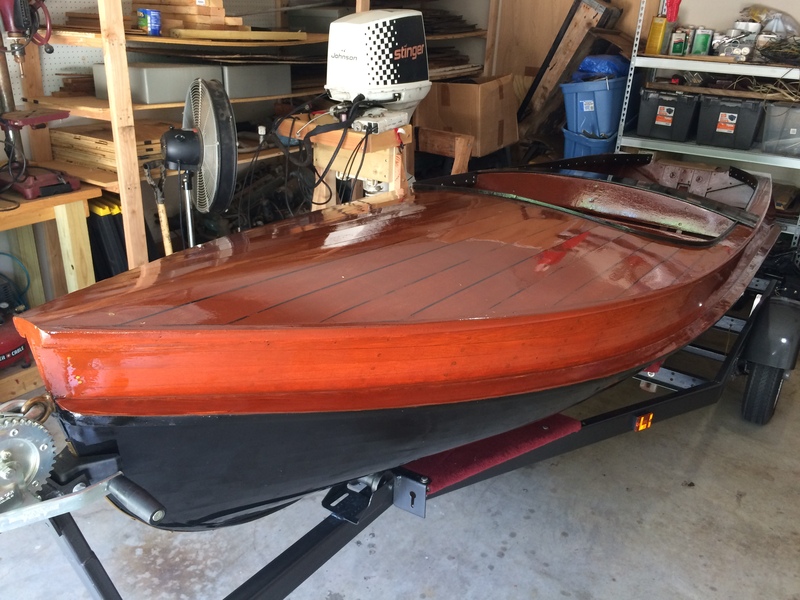 I say a trailer display, as opposed to a water display, inasmuch as this boat has not been in the water since I completed the restoration and it needs to be soaked and water-tested first. Plus, I need to install a bilge pump to make sure it doesn’t sink during the water test. 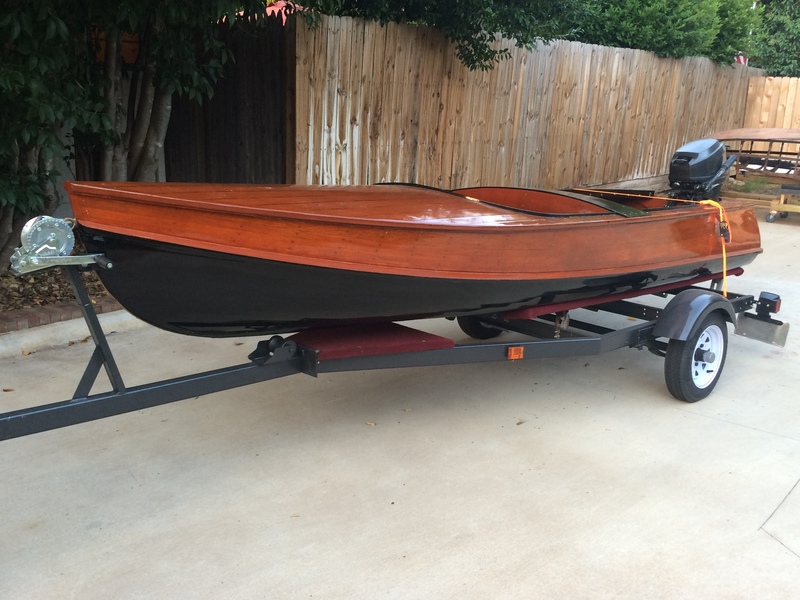 I first showed this boat at Keels & Wheels in Houston in May 2015, but it’s been sitting in my storage unit collecting dust ever since. So, this weekend I retrieved the boat from the storage unit so I could spiff it up a little before the White Rock Lake show. A good bath and a few coats of fresh varnish should do the trick. 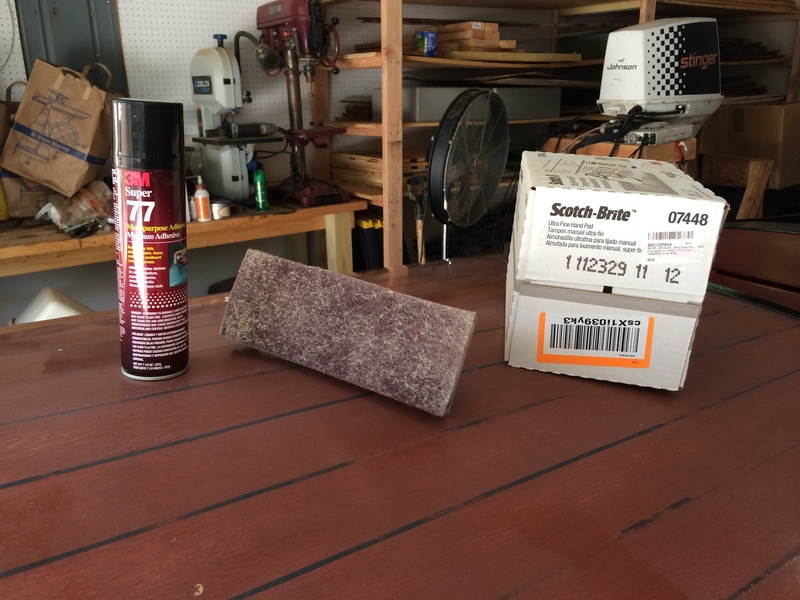 To prepare the boat for varnish I first had to scuff the existing varnish with a Scotch-Brite 07448 pad. This just takes the shine off the existing varnish without the risk of sanding through the stain and allows the new varnish to adhere. I used a block sander with some 3M Super 77 sprayed on to the keep the Scotch-Brite pad in place. In short order I had all the surfaces to receive new varnish scuffed and ready. A little bath with soap and water and we were ready to varnish. 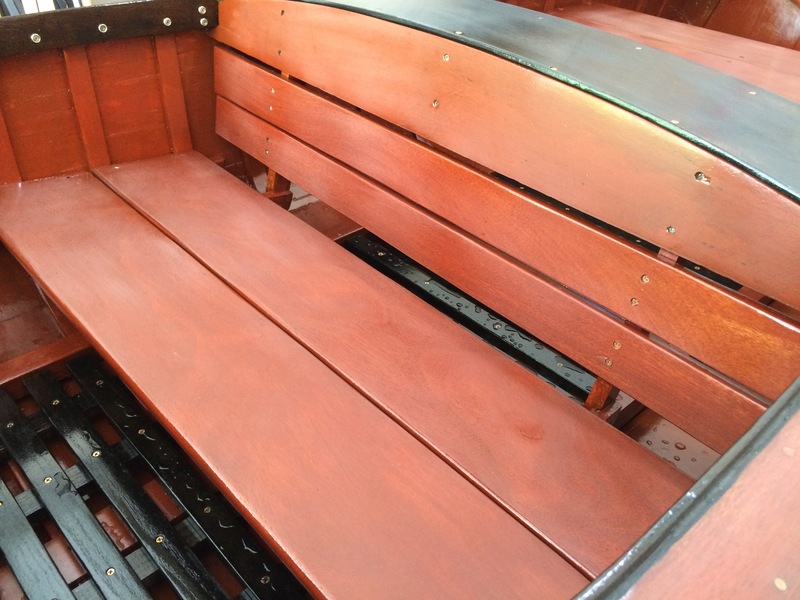 Getting a good coat of varnish on a wooden boat is more difficult than you might think. Things like dust and leaves and bugs think it’s funny to land on your fresh varnish. So, the first thing I did was sweep the garage and the driveway and then hosed them both down with water to minimize the threat of dust and leaves. Then I made sure it wasn’t Spring or Fall or dusk before I started to varnish to minimize the threat of bugs landing in my varnish. I also turned on my garage fan and pointed it toward the garage door to discourage any small flying insects. 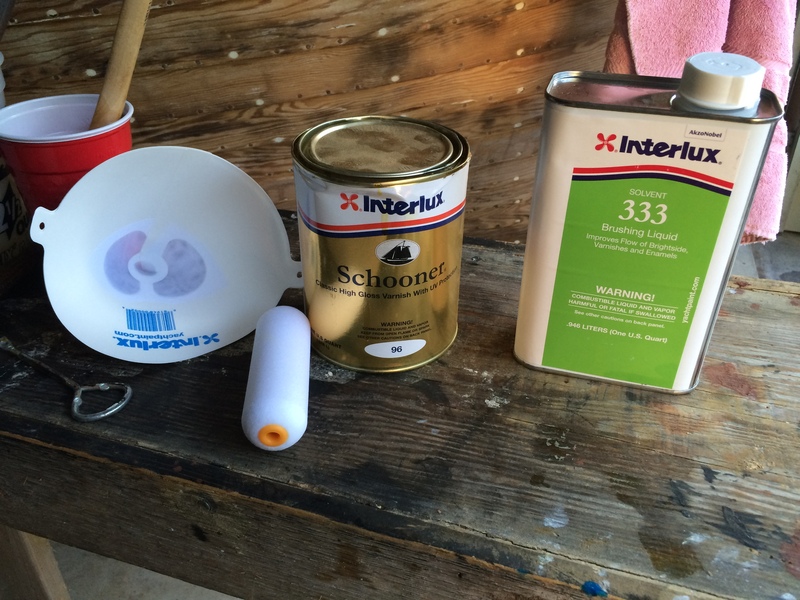 I used Interlux Schooner 96 high gloss varnish, cut 10% with Interlux 333 brushing liquid solvent, and filtered through a paper filter to remove sediment and other contaminants. I used a small, fine foam roller to apply the varnish, generally across the grain. Then I tipped it with a good nylon brush, following the grain. This gets all the bubbles out and makes sure the varnish is applied smoothly and evenly. You can also pick a bug out with the brush, if necessary. I managed to get one complete coat of varnish on the boat today. I’ll get another one on sometime this week, a third next weekend, and then a fourth sometime the following week prior to the boat show. The little Thompson should be bright and shiny by that time. I’m hoping Mark Gunter at Gunter Marine Sales will have my 1954 Mercury Silent Six outboard motor up and running next week so I can pick it up in time to mount it on the boat before the show. It’s a small motor, but more vintage-appropriate than the 1987 Mercury 8 I have on there now.